You already know that exfoliating your skin brings it a number of benefits. Maybe you exfoliate to increase blood flow, smooth the skin’s surface, or lessen the appearance of fine lines or scars. Are you ready to take exfoliation a step further to unlock even more for your skin? If so, you’re ready for a dermaplaning facial from our Los Angeles Skin Care Clinic. A dermaplane facial smooths the surface of your skin. During this treatment, a scalpel runs along your face, removing the dead skin cells and peach fuzz that result in uneven facial texture. The moment your facial is finished, you’ll be able to feel the result: silky skin. Your clear, glowing skin will likely continue. The soft hairs on your face trap oils. Once those hairs are removed, your skin is able to stay clear and healthy. What’s more, a dermaplaning facial sends signals to your cells that they need to regenerate. The new cells can help reduce the appearance of scars and hyperpigmentation. Additionally, because a dermaplane facial removes the top layer of dead skin cells, it removes barriers to product penetration. Anything applied to your face after your facial will be able to sink straight into your living cells, making it more effective. 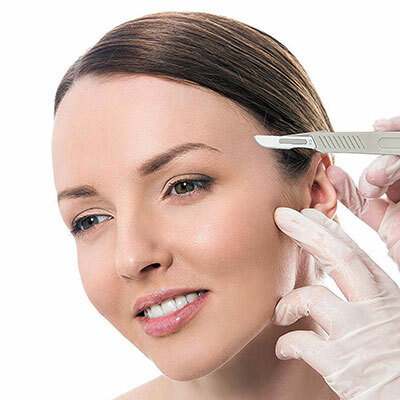 During the dermaplaning facial, your face will be “shaved” with a sterile, extremely sharp scalpel. The scalpel will be held at a 45 degree angle as it moves along your face. This is an extremely effective way to exfoliate your skin, removing the top layer of dead skin cells and any facial hair. You’re left with smoother, fresher looking skin. Unlike many other hair removal techniques, a dermaplaning facial is painless. You don’t have to deal with any of the tenderness or redness that comes with waxing, weaving, or laser removal. 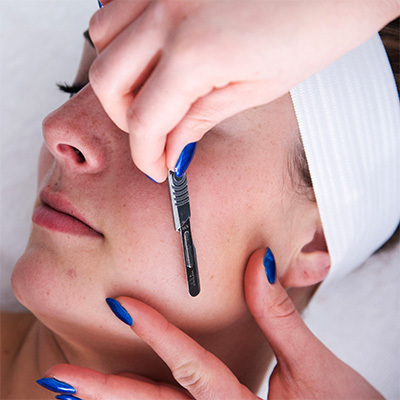 How is a dermaplaning facial different than simply shaving your face? While a standard razor can catch some of the dead skin cells that gather on the surface of your facial skin, it’s ultimately not sharp enough to be the most effective tool. Our dermaplaning scalpel is a smaller, sharper blade that gives you a deeper exfoliation, evening your skin’s tone and texture. Unlike many other facial procedures, you’ll experience virtually no down time after your dermaplaning facial. Your skin will immediately feel silky smooth and, because newer skin cells have been exposed, you’ll walk out looking radiant. After a dermaplaning facial, all of your at-home treatments will increase in effectiveness. With the top layer of dead skin cells removed, moisturizers, masks, creams, and more can penetrate more deeply into your skin, giving you better results. You’ll continue to see the benefits of a dermaplaning facial each morning as you apply your makeup. Because this facial removes anything that would cause your skin’s texture to be uneven, your makeup will easily glide on. You’ll be amazed how different your daily foundation will look when you give it a smooth canvas. f you’re ready to unlock your smoothest, most glowing skin with a painless facial and minimal downtime, contact Face of Jules.